I didn't go in the Crescent Cafe but had it been open I might well have been tempted to hand over 7p for a cup of tea, or even 17p on a Bacon Roll, though its unlikely I would have been hungry enough to deal with Egg + Bacon + Sausage + Toms, nor have been able to spare the 56p to pay for it. It seems nothing now, but money was very tight for me then though that 7p would only be around 38p allowing for inflation, so still a bargain. 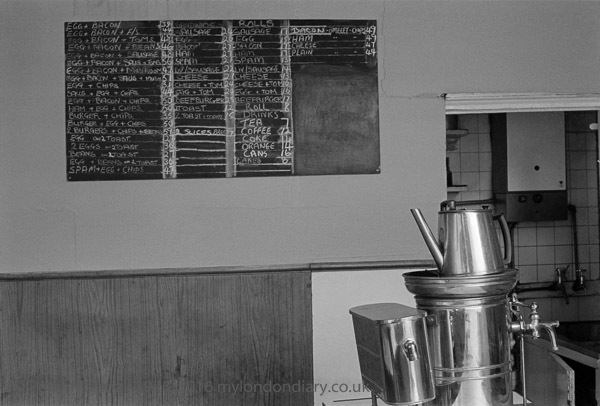 It was however probably the highly detailed menu on the blackboard that attracted my attention, along with the shiny aluminium of the urn and teapot. I'm not sure why it was closed. Perhaps it was a Saturday or Sunday, or, as it was taken in August, perhaps the owners were taking their annual holiday, but the place was clearly still normally in business. I can't remember either what had taken me to north London, but I suspect I may have been carrying a large orange box of Agfa Record Rapid, following a visit to "the Brovira Boys of Muswell Hill", Peter Goldfield and Martin Reed, who imported this holy grail of photographic paper into the UK, and published in 1978 'The Goldfinger Craftbook For Creative Photography', now rather dated but available on-line. Later I got to know Peter, and wrote a short piece on my >Re:PHOTO blog when he died in 2009. Martin Reed went on to continue the work they started at Silverprint, for many years from 1984 in Southwark and still in business, though without Martin, in Poole and by mail order. Record Rapid died so far as photographers were concerned around 1988, when Agfa were forced to re-formulate it without cadmium for health and safety reasons. Cadmium compounds are highly poisonous, and are still used in artists' pigments, but while they are fixed on the surface of paintings, and thus safe unless artists licked their brushes, a considerable proportion ran off into the drains when photographic paper was processed, and their use was banned in most countries. Papers containing cadmium salts continued to be made in other countries for a few years but none achieved the properties of the old Record Rapid, and probably the closest approach to it now involves using some inkjet papers.